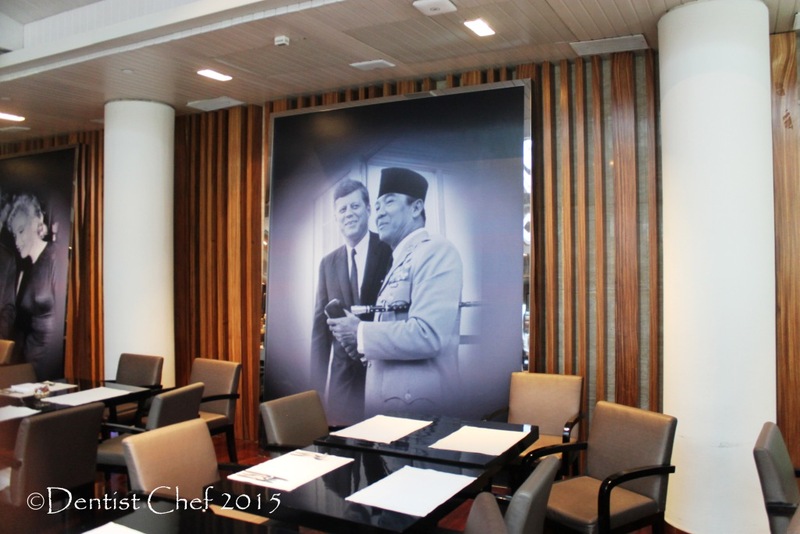 Signatures Restaurant in Hotel Indonesia Kempinski Jakarta is presenting a selection of authentic Indonesian cuisines from five different regions of Indonesia archipelagoe over a five-week period for embracing Indonesia 70th independence day, as well as the hotel’s 53rd birthday. First Week . 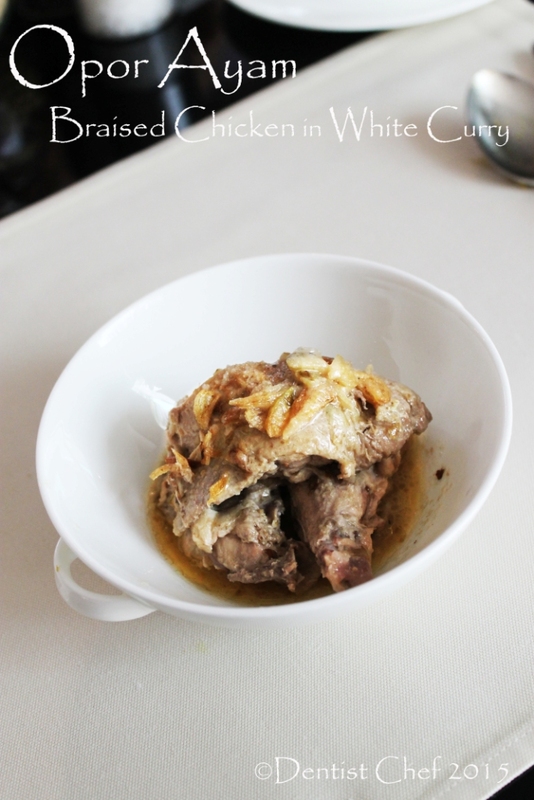 Sumatra Islands cuisines. 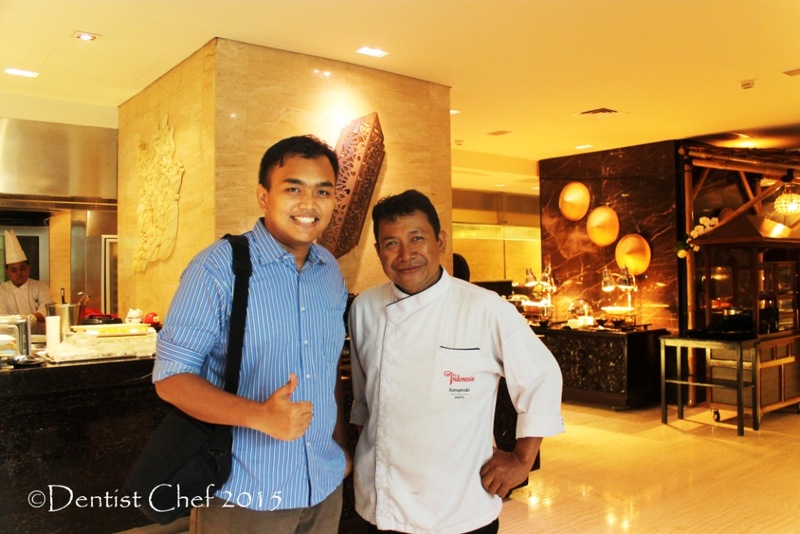 5-11 Agustus 2015 by Chef Marco Lim dan Chef Partogi Samosir. Third Week. 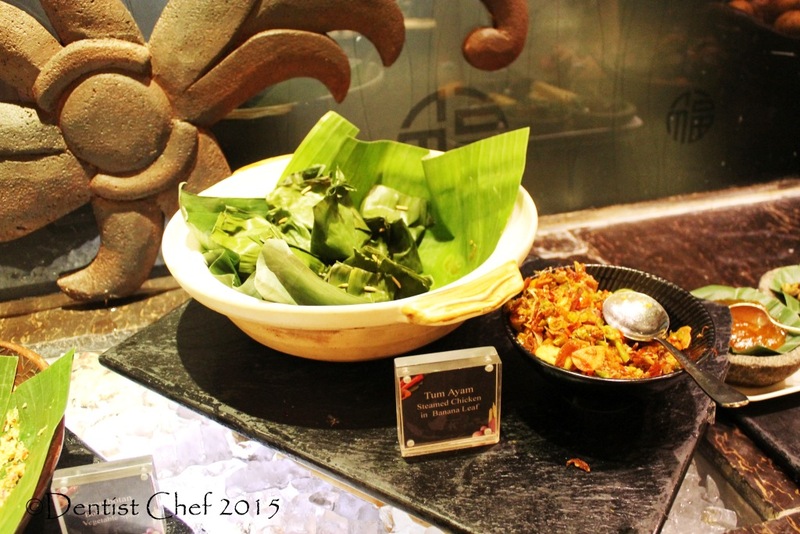 Bali-Lombok islands cuisines. 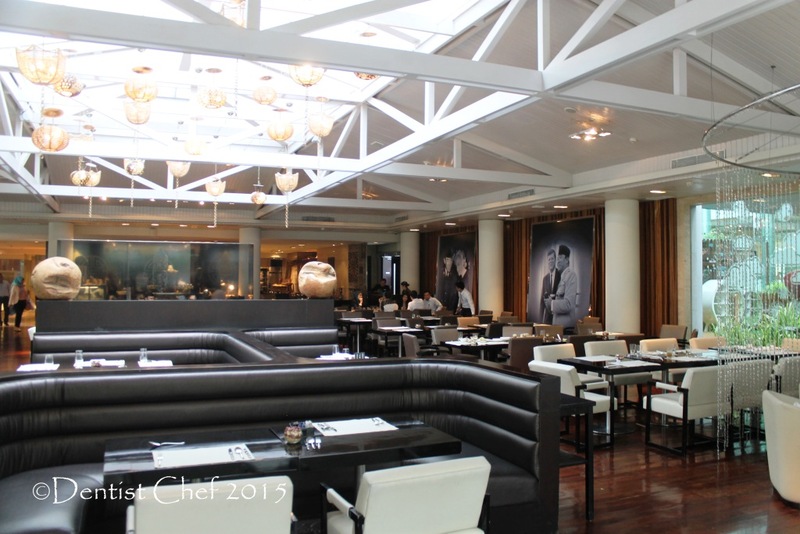 19-25 by Chef Ketut Sumerata. Fourth Week. 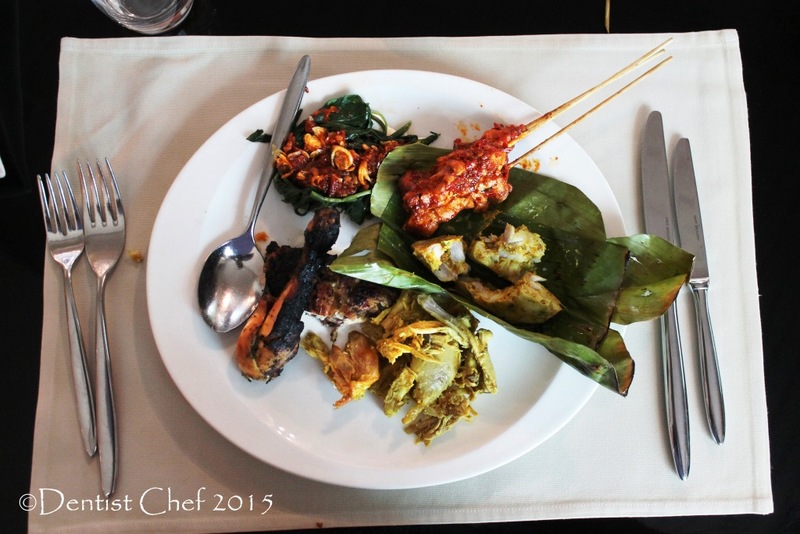 Borneo islands cuisines . 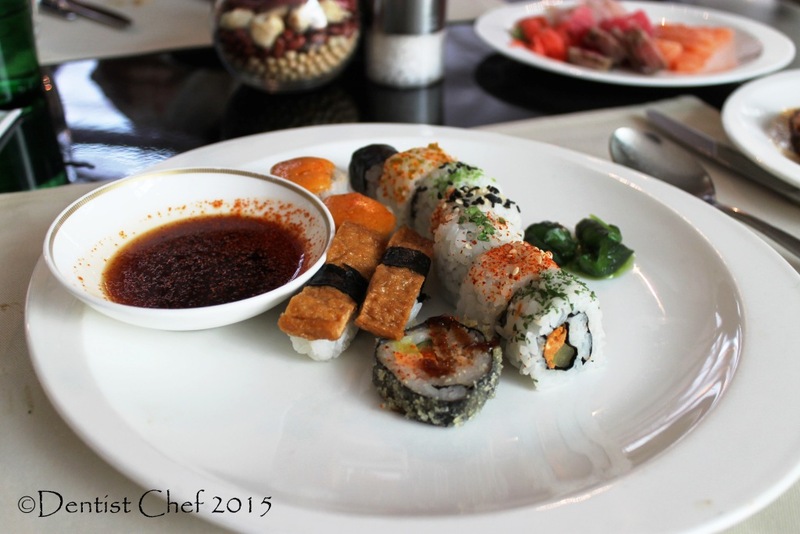 26 Agustus – 1 September 2015 by Chef Meliana Christanty. 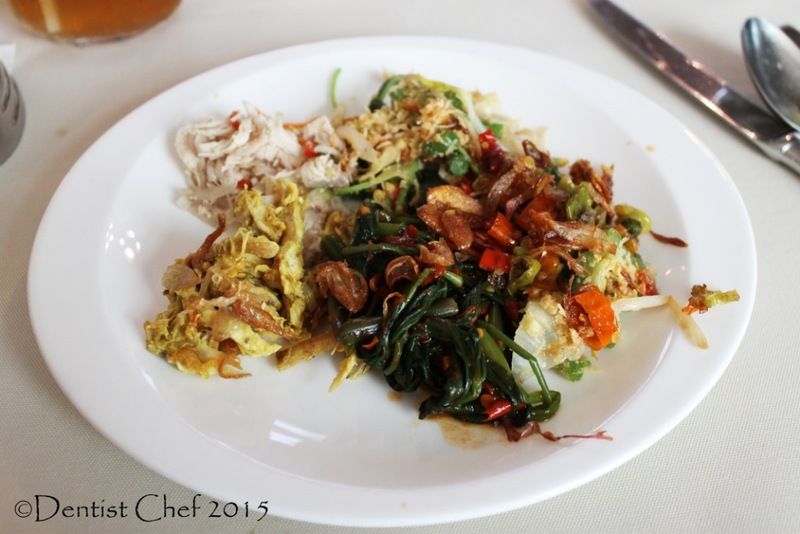 Mr. Dentist Chef luckily can attend the Balinese-Lomboknese cuisine and here what i spot on; well this is actually not the first time i had Chef Ketut Sumerata’s dish, i’m pretty much known what i’m gonna had; a tasty Balinese meals! 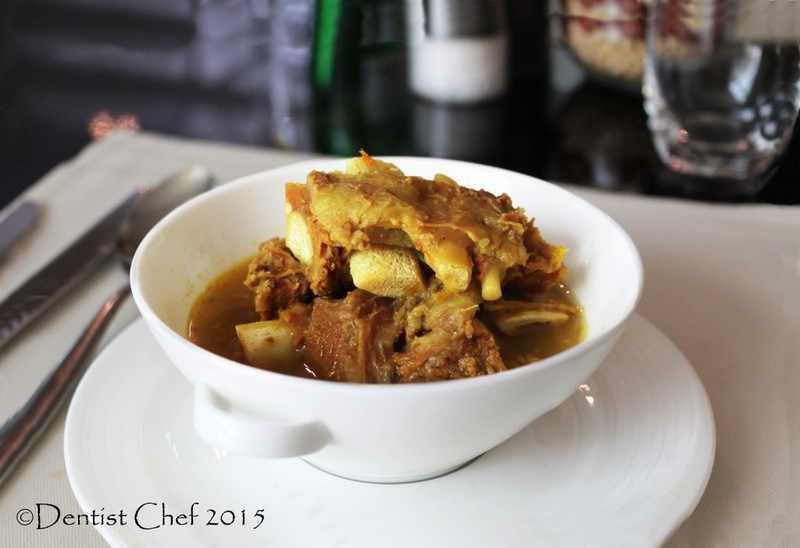 Balung Mekuah is Balinese beef ribs soup similiar to pindang tulang from Palembang. Balung means ribs and mekuah means soup, so it’s literrary translated as rbs soup; despite it’s spicy looks, it’s actually very light and i guess this just perfect to tickling the taste buds as apptizer, slurrpingly delicious!!! I really lovin it, hence i photogrpah it over and over; people used to served balung mekuah with rice but i felt comfort to digging it on it’s own. 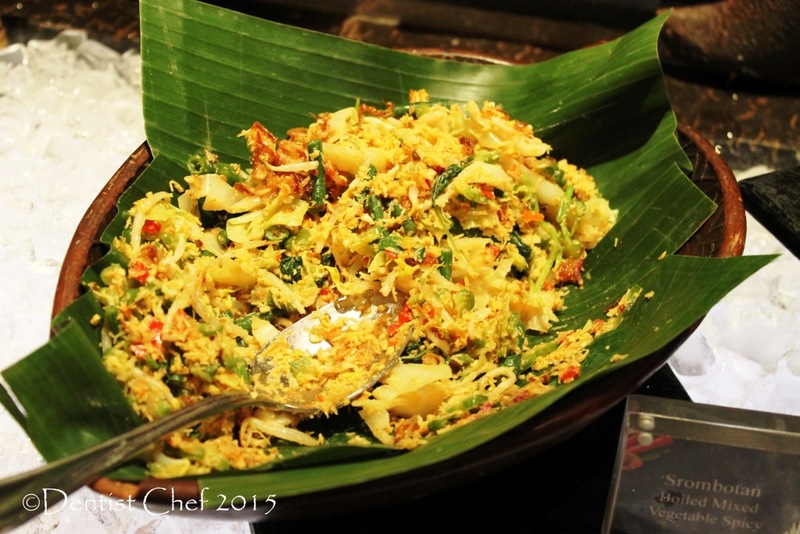 Serombotan, Balinese salad similiar to Urab with nice tangy kaffir lime dressing and some Balinese base genep or yellow basis seasoning made of turmeric and other spices. 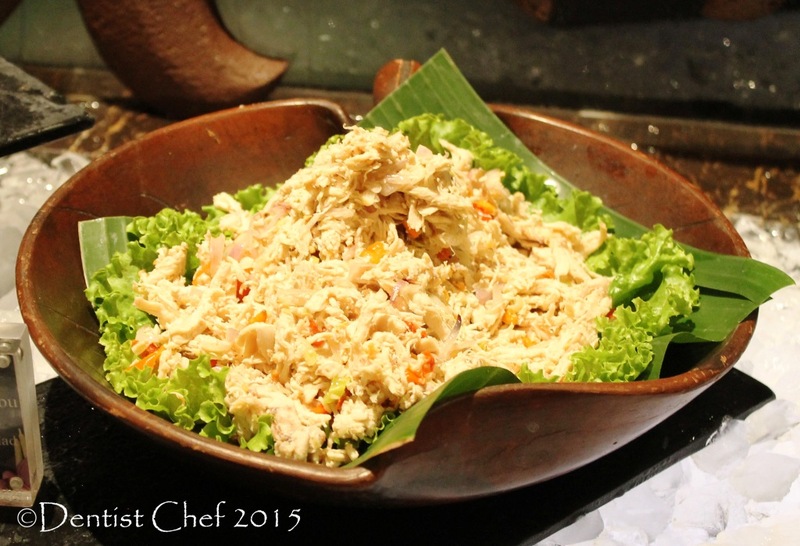 Serombotan is actually a compliment of Balinese Mix rice but feel free to enjoying it as appetizer. 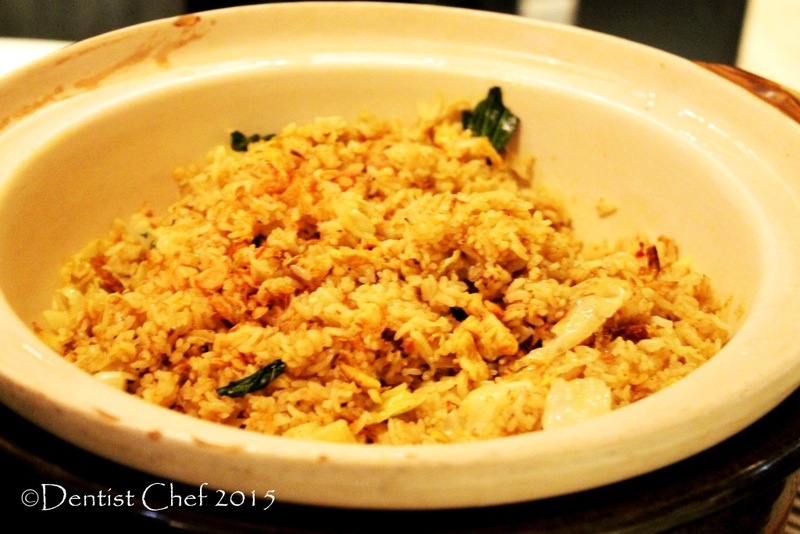 Nasi Goreng Bali, one Balinese delicacy fried rice with mild spicy taste, it’s flavoursull and really comforting for my Indonesian licking. 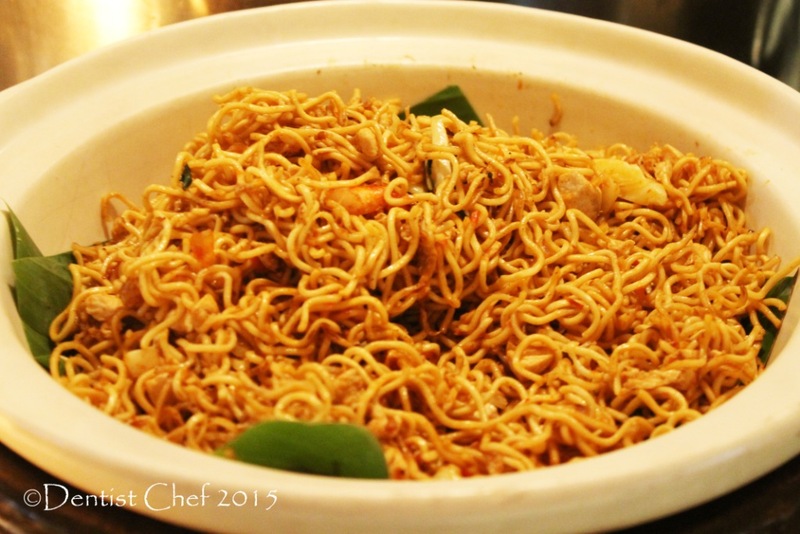 Mie Kober Denpasar, a very hot and spicy stir fried noodle with bird eye chili sambal. This is the really spicy, i’m Indonesian and it’s embarrasing that i can’t barely stand it, but my lady partner really enjoying it. 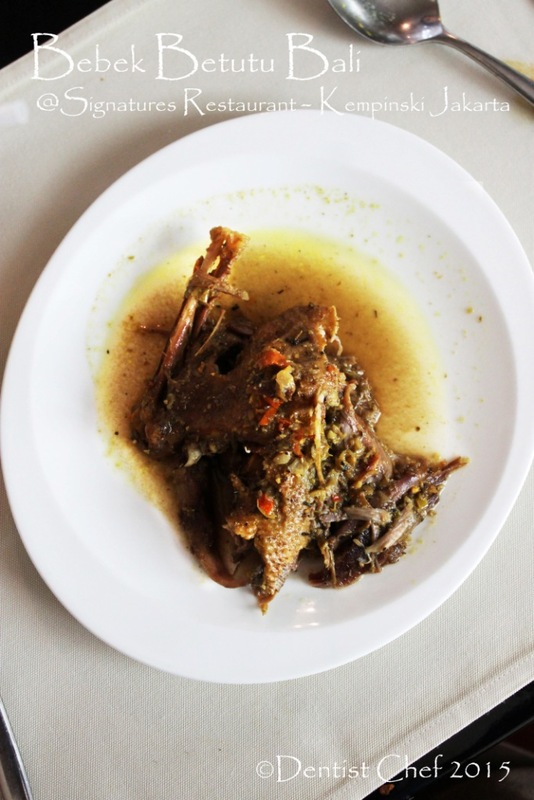 Bebek Betutu is a Balinese dish of roasted duck on Balinese spices. 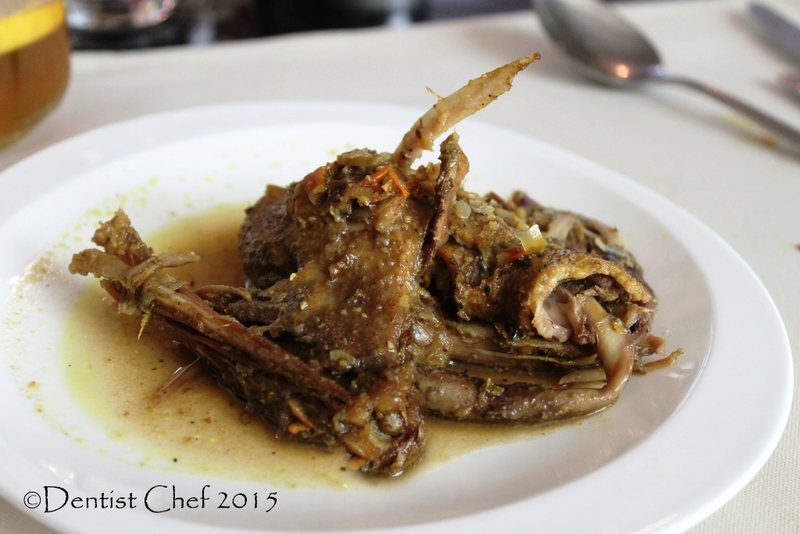 What i really adore about Chef ketut Sumerata is how he used to use local duck instead of imported peking duck for this bebek betutu. Local breed duck gotta threat carefully to turn it into this delicacy and i really appreciate the effort he made this far. The bebek betutu is definitely tender because it’s slowly roasted for several hours until the meat it’s fallen off the bone! 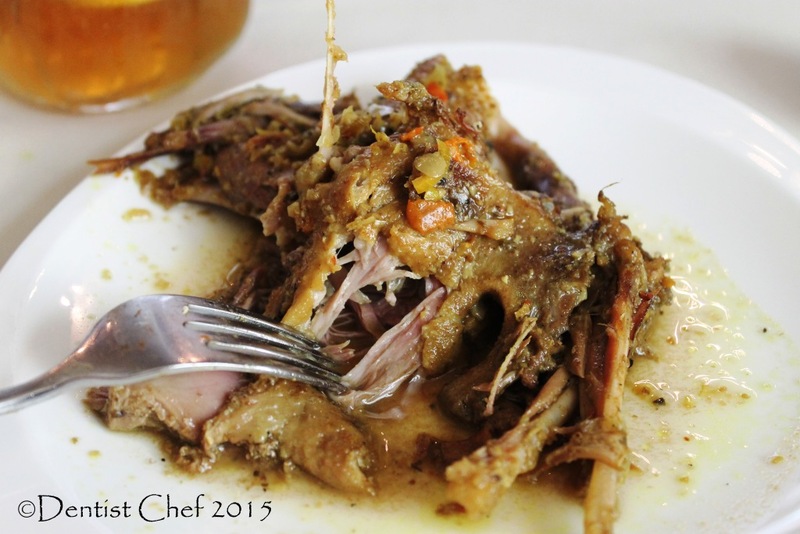 All the spices penetratedd into the duck meat and made it lovely even more. 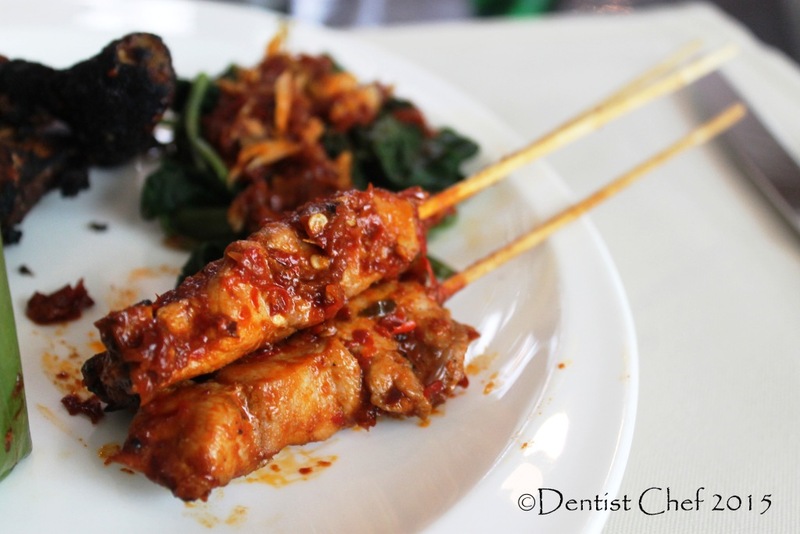 This is Mr. Dentist Chef Nasi Campur Bali ! 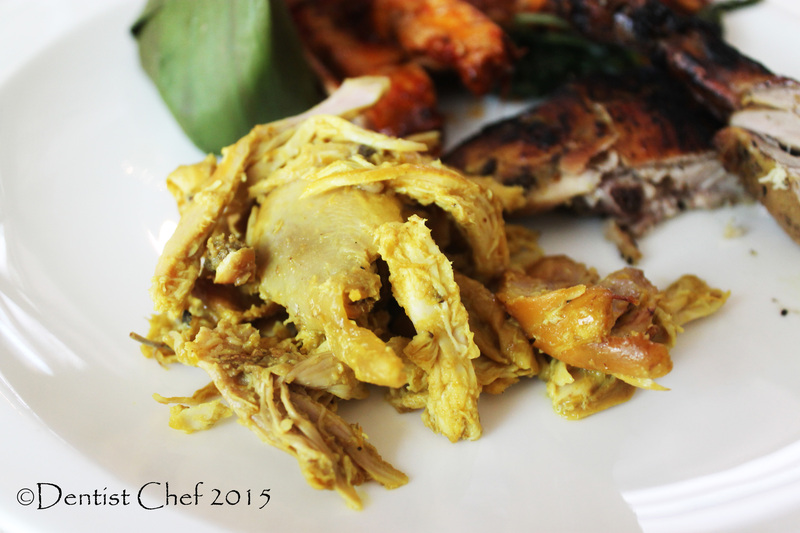 Tum Ayam, a Spicy chicken with yellow-reddish spices, very tender and moist with nice light seasoning. 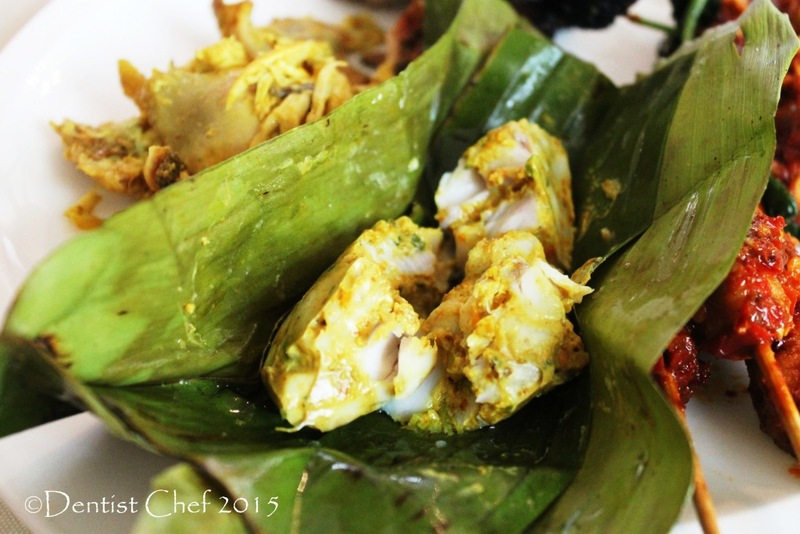 You can served the steamed chicken in banana leaves with some sambal but i’m fine wothout the sambal. Brengkes Ikan, a spicy spanish mackerel fish fillet with yellowish turmerik and sand ginger spice, very nice! 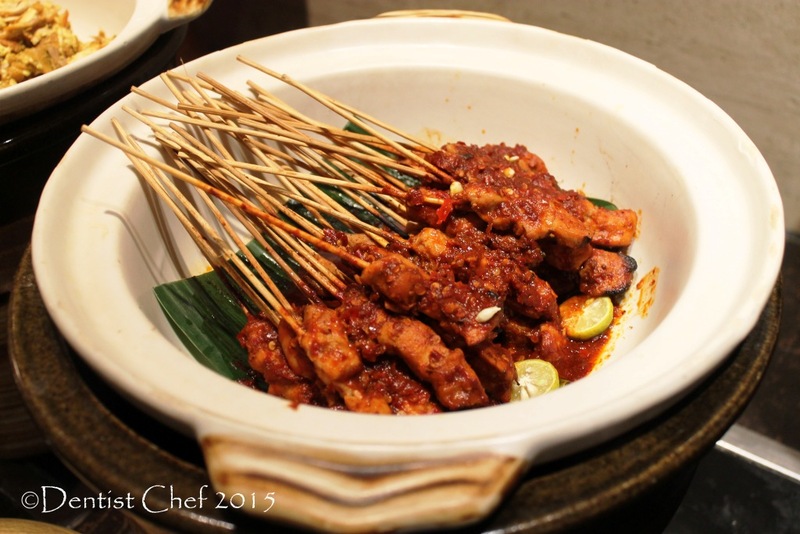 Sate Ayam plecing, a bamboo skewered chicken breast dressed with spicy chili sambal. 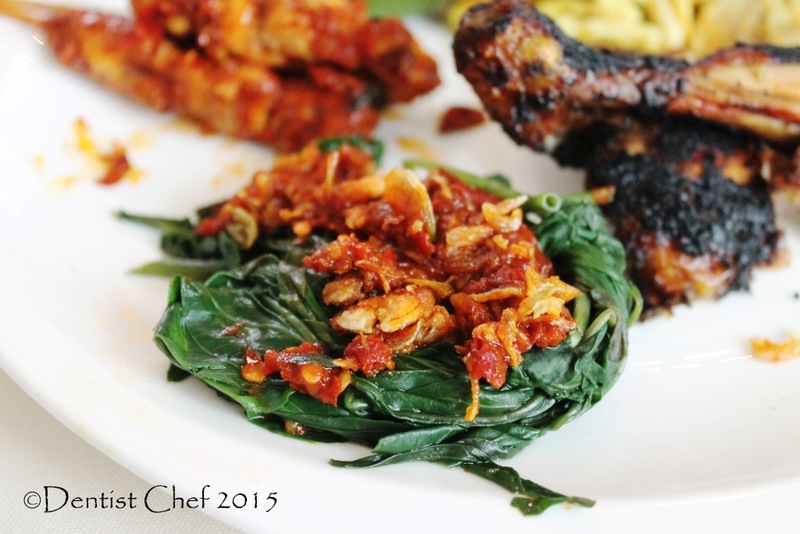 I really enjoy the tangy sambal plecing with nice hint of of tiny local kaffir limes flavour on it. 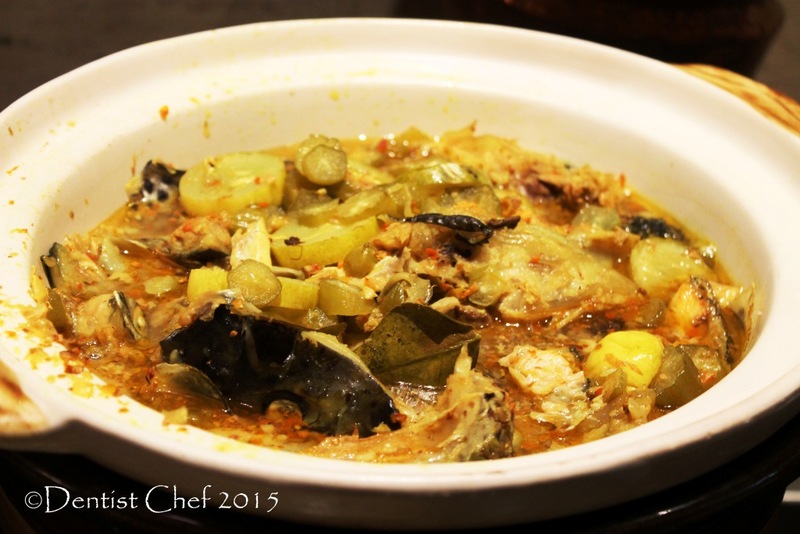 Salmon mekuah, a spicy and sour salmon head soup. i really enjoying this because it’s similiar to Palembangnese pindang ikan, but the sour agent was bilimbi fruit instead of tamarind or cherry tomato. 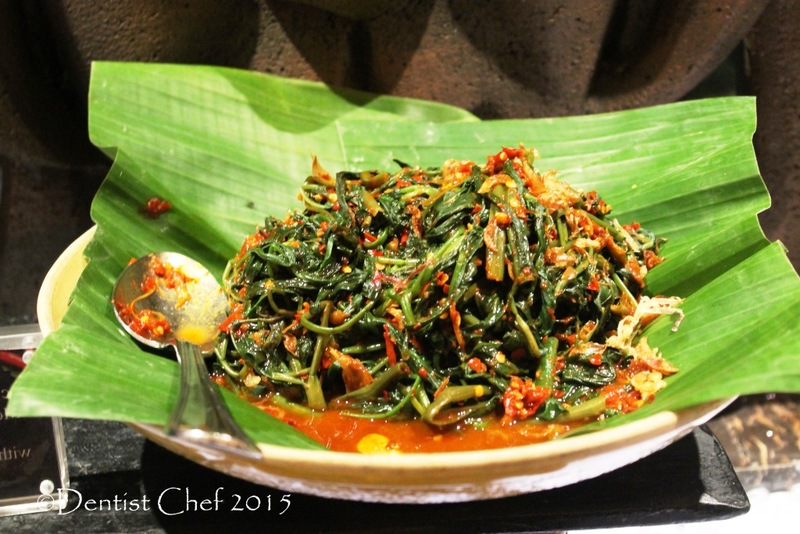 Kangkung plecing, plecing is Balinese translation of chili sambal and kangkung is actually water spinach or morning glory vegetables. I guess this is the most consumed veggies among indonesia, this plecing kangkung is just lovely; despite it’s vivid red color it’s actually not that hot and spicy thou. 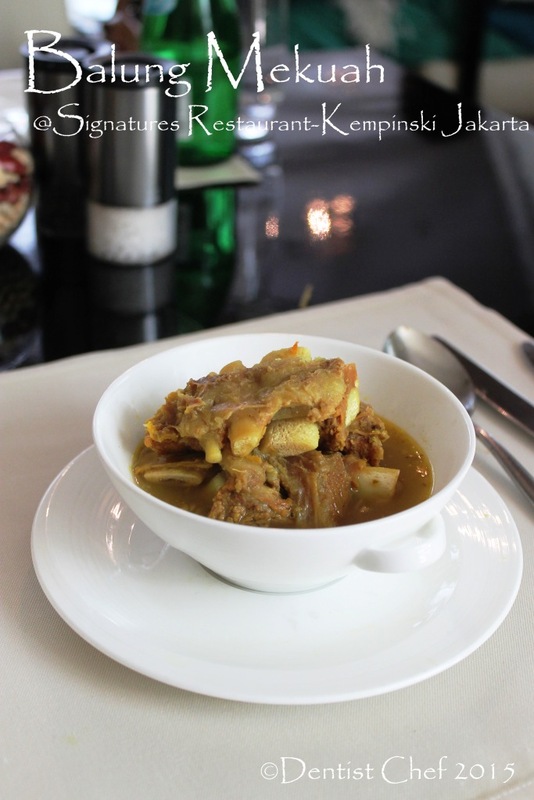 Opor ayam is a white curry chicken , i thought opor was from Central Java and nver known that opor ayam is also a part of Balinese cuisine. 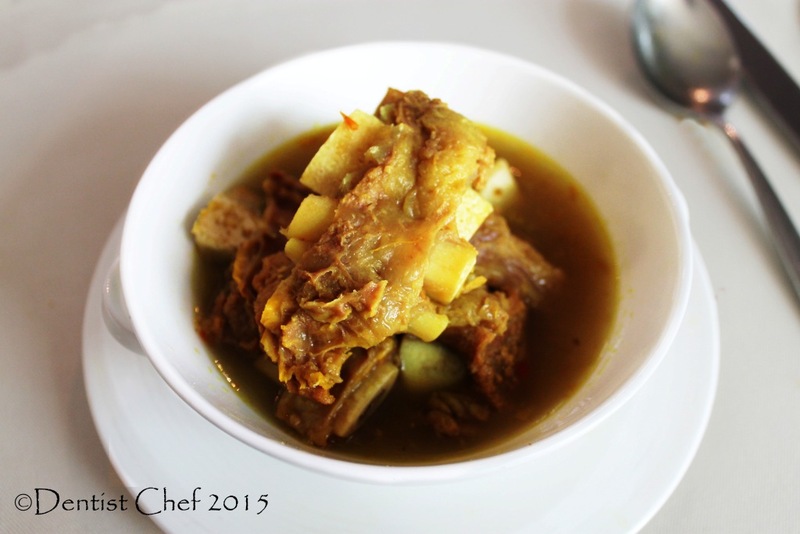 For those who doesn’t like spicy food maybe this opor ayam is your sanctuary and comforting food, lol. 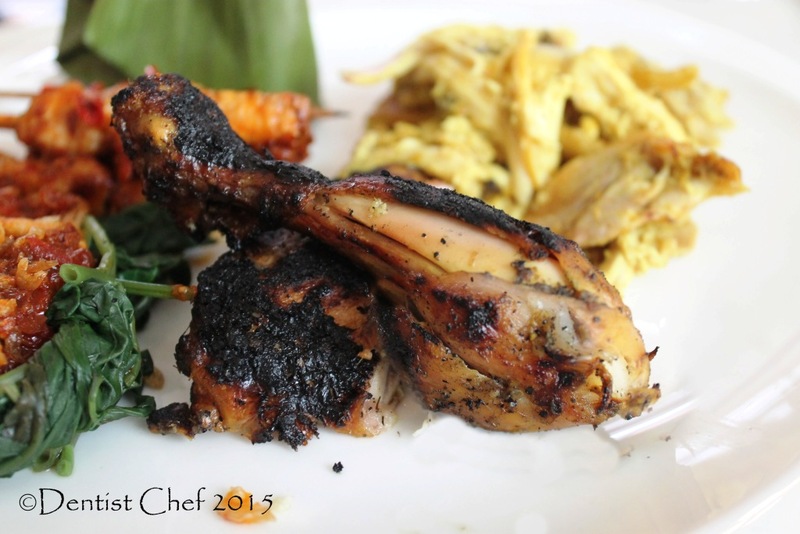 Ayam Taliwang, grilled ichicken with Spicy Lomboknese spices. I can’t stand the ammount of peper the chef using in this dish. 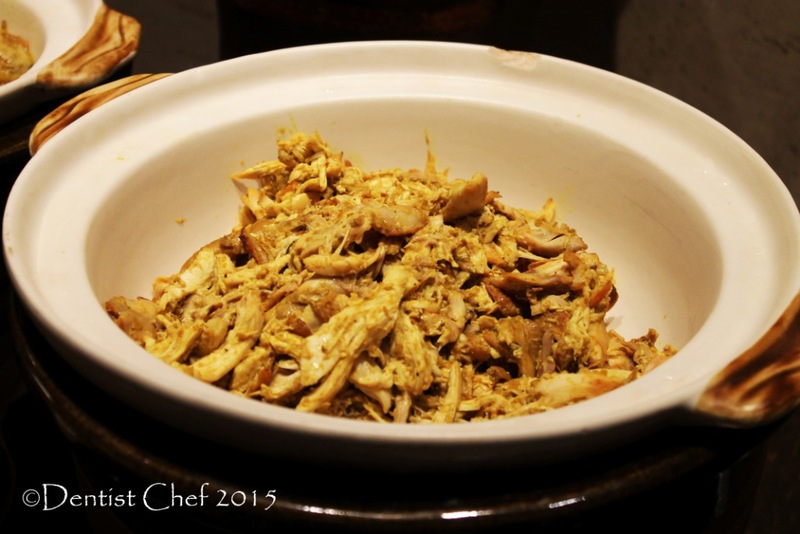 Ayam Mekalas, Shredded grilled chicken with curry like yellowish cucunut seasoning. Lovin the smokey flavour on it; it’s also moist because the chicken is cooked with the coconut seasoning right after it’s grilled and shredded. 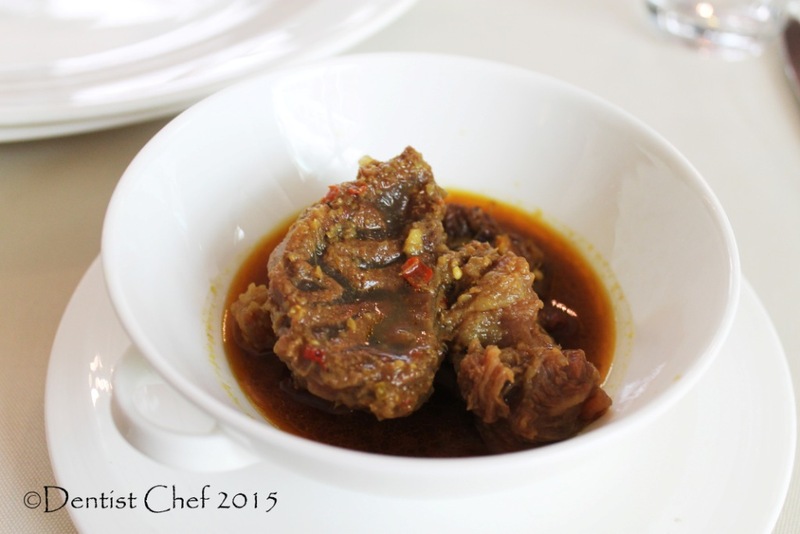 Daging bumbu bali, a Balinese spicy stewed beef using generous amount of chili on it. 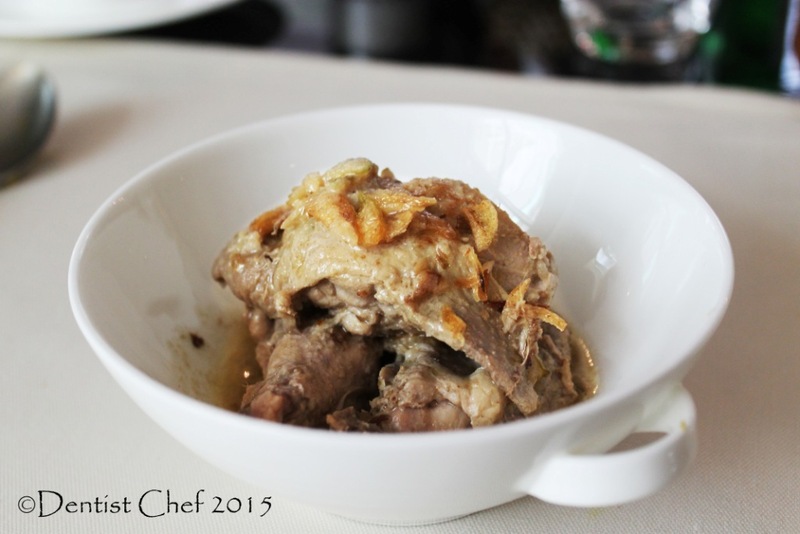 The chef using beef shank for this daging bumbu bali, cooked slowly untl the sinew and tough connective tissue turn into transparant gelatine and tender, scrumptious dish!!! 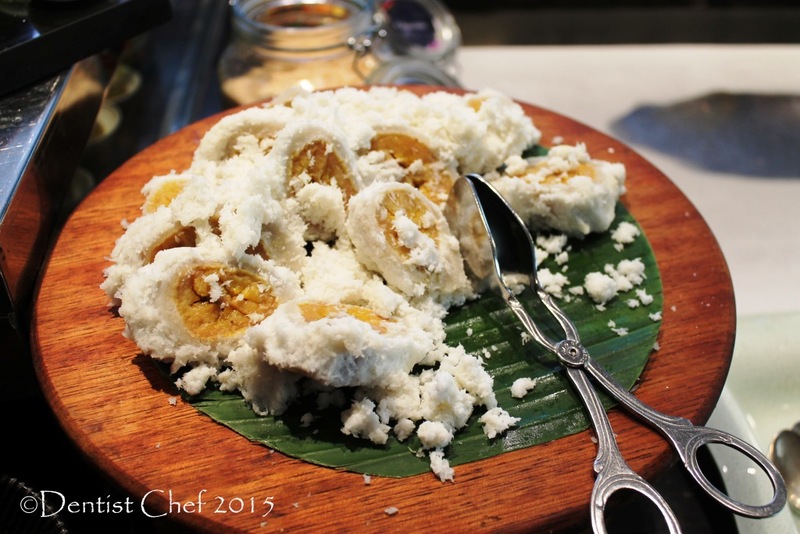 Pisang Rai, a muct have dessert on Balinese restaurant; nice and sweet plantain wrapped in rice flour and then rolled in dessicated coconut flesh and then steamed. lovely!!! 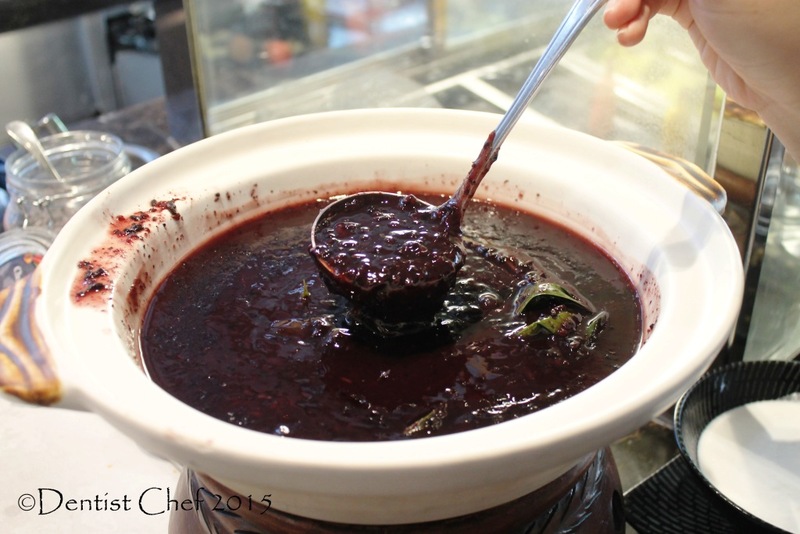 Bubur injin, swetened black glutious rice porridge that served with savoury boiled coconut milk. the colaboration of sweet and goey black glutinous rice with salty and creamy coconut milk is definitely damn delicious!!! Awesome selection of seafood desplayed today; tiger prawn, shrimp, New Zealand Mussel, flower crab and mud crab. 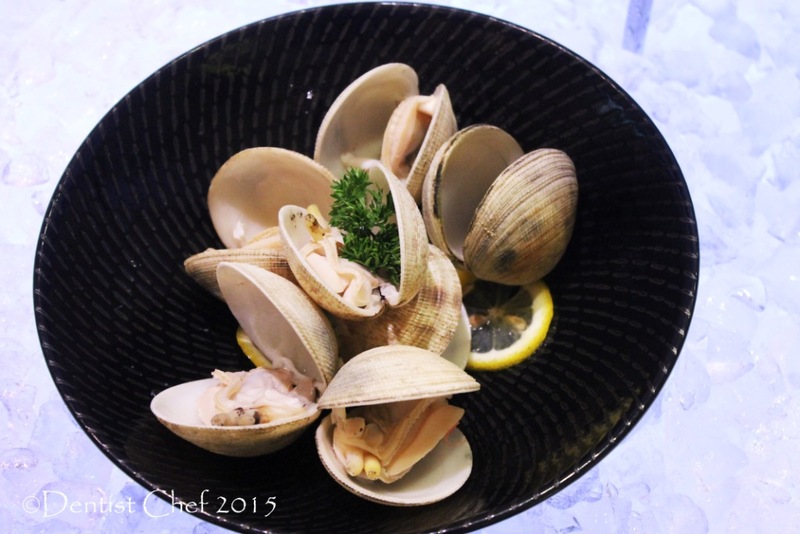 The seafood alse served with several kind of sauces to dip it too. Boiled Kerang tahu or tofu cockle; i really lovin it!!! My partned had some udon noodle soup that prepared bt the staff as the custore asking for it; it’s nice! 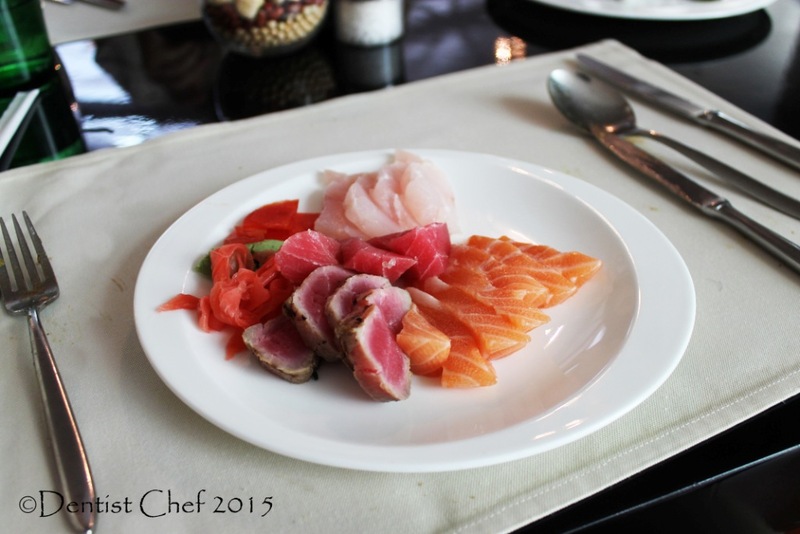 Nice selection of sashimi; it’s so fresh and lovely. I had tuna tataki, salmon, tuna and seabass sashimi. 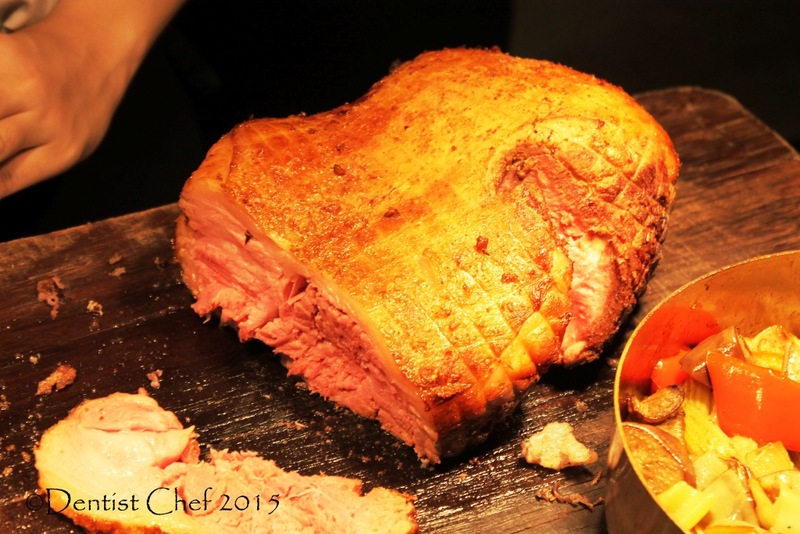 Slow roasted beef ribeye, really lovely; tender, juicy, beefy and well seasoned. 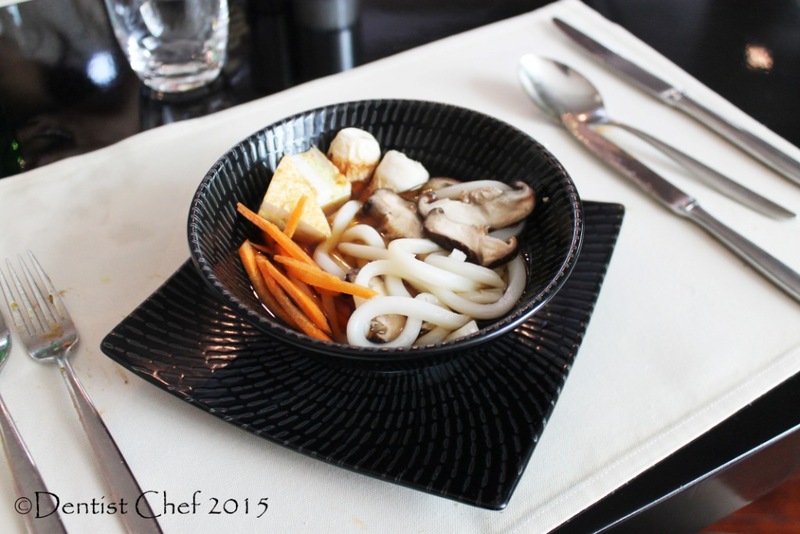 You can choose served it with sauteed vegetables and your preference sauce. 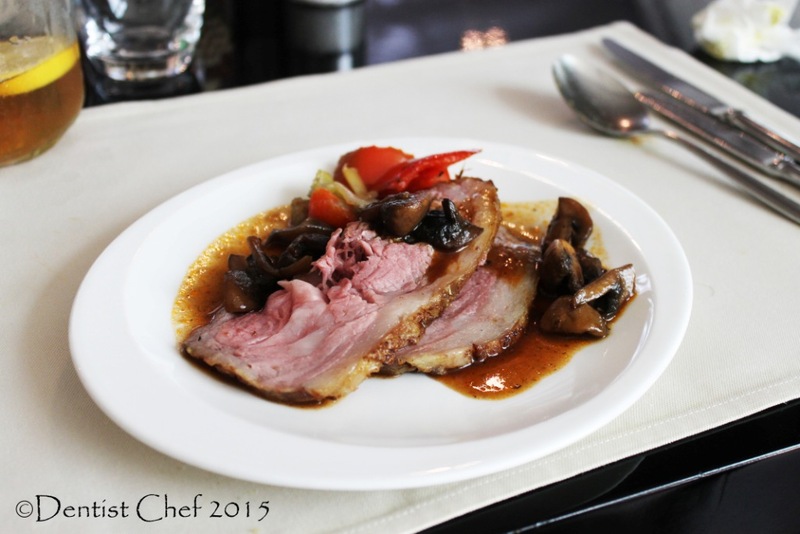 I served my roasted ribeye with mushrooms sauce! 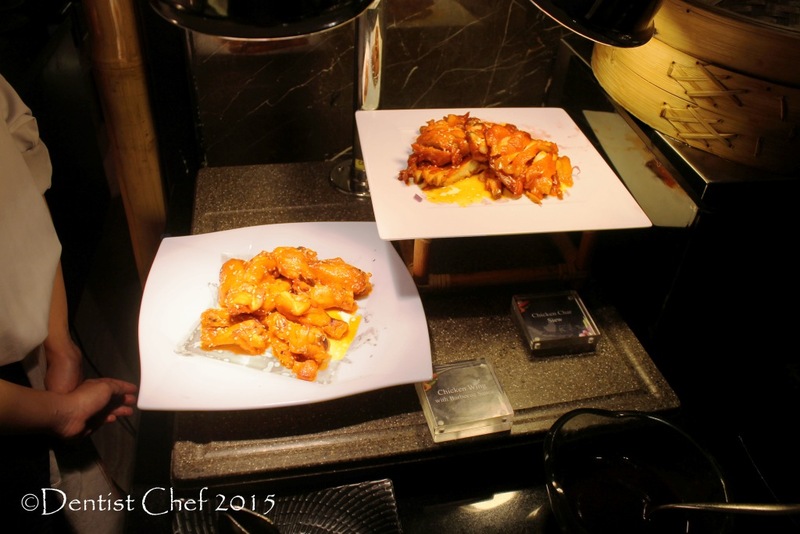 Roasted peking duck and char siew chicken wing looks so tempting to try! 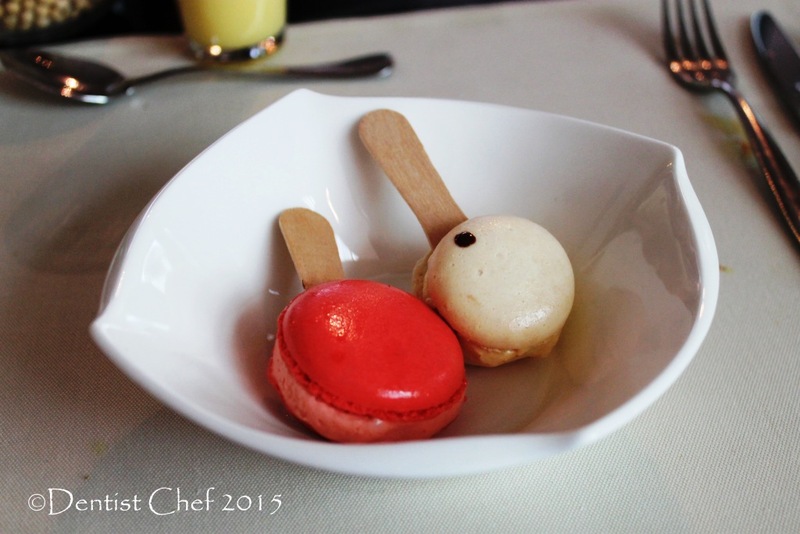 I’m not a dessert person, but this maccaron ice cream sandwich popsickle is really tempting me to give it a try! This is preserved yuzu orange cheese cake in glass is really something to died for, lovin it’s creamy, cheesy and citrusy tangy flavour! 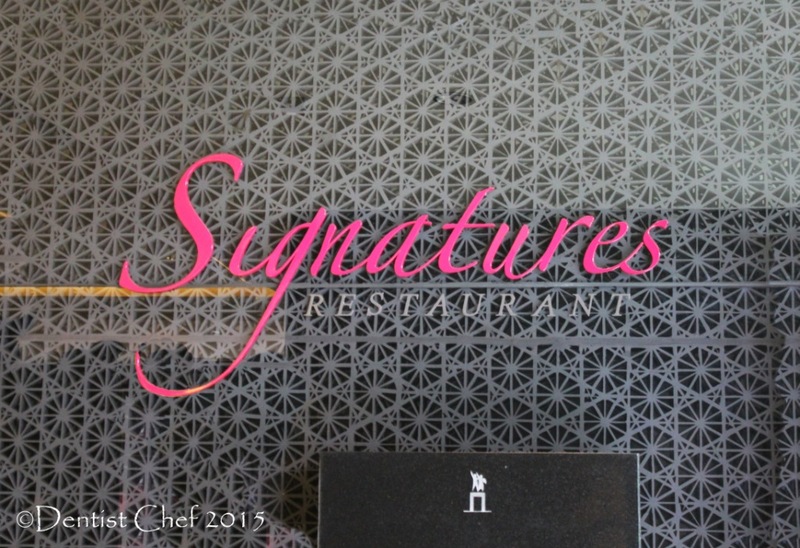 Overall Signature Restaurant Kempinski Hotel Indonesia served an excellent dining experience; excellent service with nice and authentic Bali-Lombok authentic cuisine with well known guess chef and i salute fot the dedication to represent and promote the Indonesian traditional cuisine. 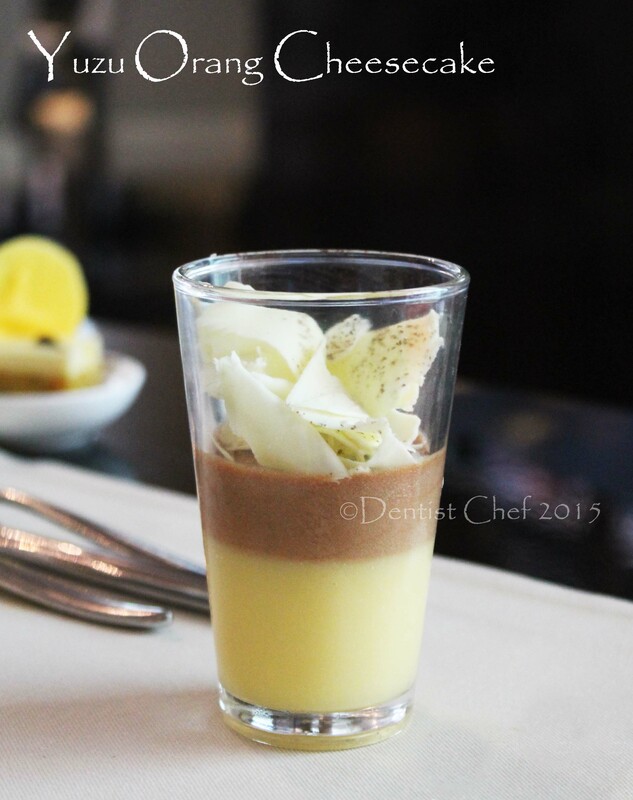 Thankyou Kempinski Hotel Indonesia! 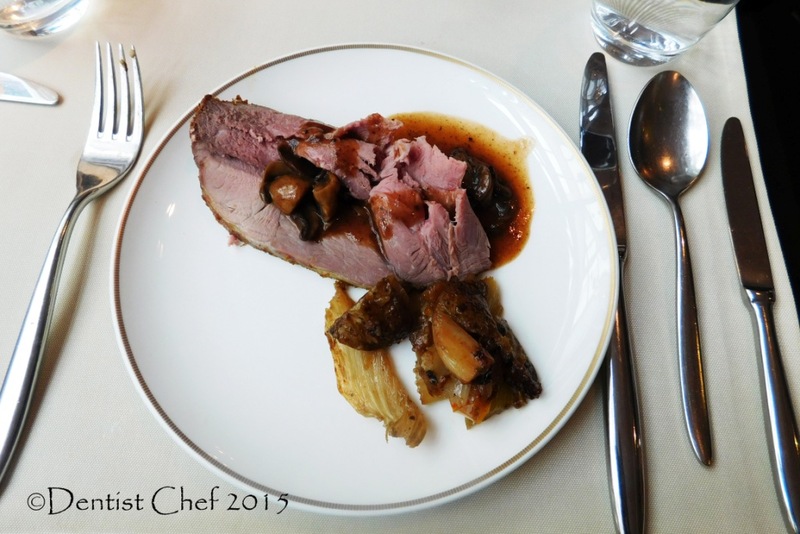 This entry was posted in Appetizer, Commercial Food Review, Fine Dining (Homemade) Recipe, Indonesia Dessert Recipe, Indonesian Beverages, Indonesian Food, Italian Food, Japanese food, Malaysian Food, Thailand food, Uncategorized, Western Food. Bookmark the permalink. You’re very lucky to have so much wonderful food at the same time! Looks like you’re into dining reviews as well these days. Congrats, Dedy! 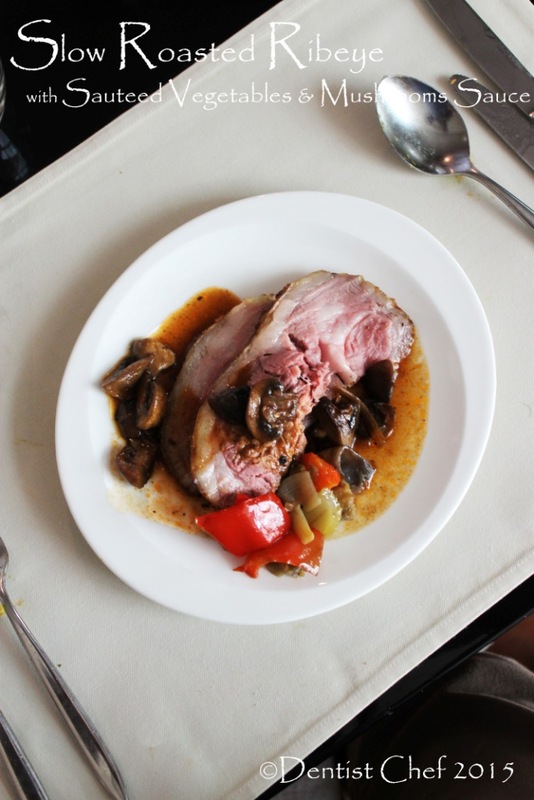 Feeling hungry now……. 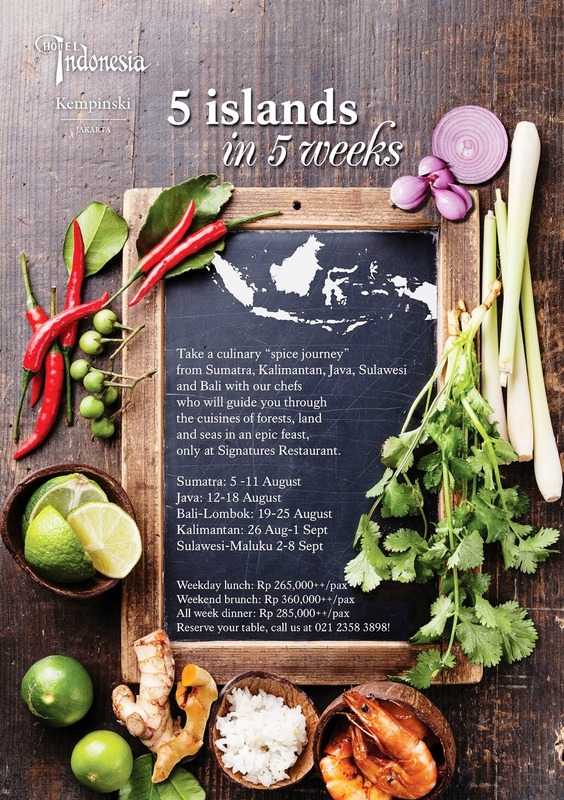 Looks like a great way to explore the diverse flavours of Indonesia. Kalau punya duit rasanya pengen datang ke Signatures tiap minggu itu. Aku cuma nyobain yg Kalimantan aja. Meskipun sudah sering ke Bali, ternyata banyak makanan yg belum pernah aku coba kalau liat postinganmu ini bro. Ayam Mekalas dan Ayam Pelalah baru tau nih. Everything looks so beautiful and tasty! Lucky you! Looks like a great pklace Dedy! This looks awesome! You’ve really made me hungry. 😉 Thanks for this. 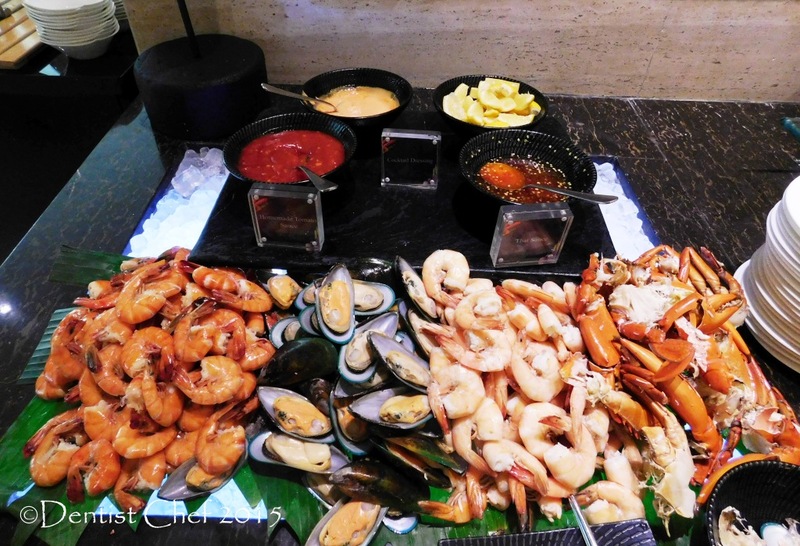 What an incredible array of food…a real experience to be able to try so many different foods.